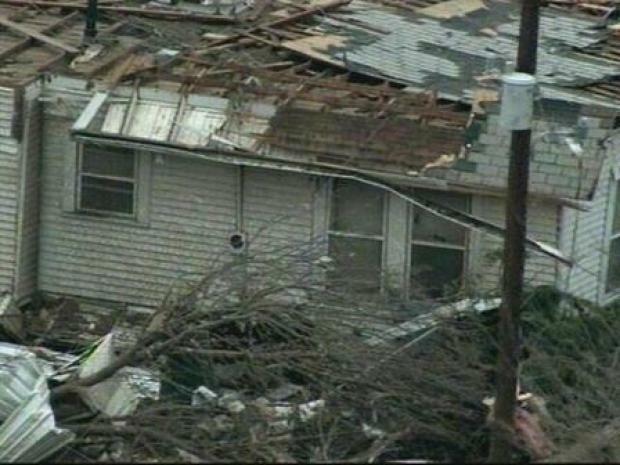 Denison Police Lt. Billy Shaw told The Associated Press that "it did appear to be a tornado, by looking at the damage." The National Weather Service confirmed Tuesday afternoon that two EF-1 tornadoes caused the severe damage in Grayson County. More than 20 homes were damaged, 12 destroyed in Grayson County. The NWS confirmed one tornado was two miles west of Southmayd, and another affected southwest and south central parts of Denison. At least 1 person suffered injuries from flying debris, but no fatalities were reported. NWS survey teams say the damage path for the Southmayd tornado was nearly 200 yards wide and 2 miles long. Aerials Show Tornado Damage in Grayson Co. The National Weather Service confirms two tornadoes touched down in Grayson County on December 8, 2008. The Denison damage path stretched 125 yards wide and 2 miles long. "Numerous roofs are gone," according to Shaw. Aerial photos from Chopper 5 show the extent of the damage. Utility crews continue working to restore power to a large area across Grayson County, including in the communities of Sherman and Denison. The American Red Cross has set up a shelter at the Collinsville Fire Station. At the height of the storms, tornado warnings were issued for Grayson and Collin counties.